The most recent census data indicates that about 63 percent of the South African population already lives in urban centers. The country’s National Development Plan has estimated that continued urbanization will increase this proportion to 70 percent by 2030. South African cities have a backlog in the provision of formal housing to poor people and in most cases they are falling further behind. For this reason informal settlements are growing and informal settlement upgrading is becoming an increasingly pressing policy priority. 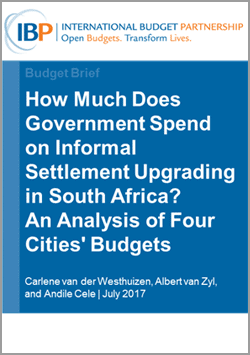 This brief describes how four South African metropolitan municipalities — Buffalo City Metropolitan Municipality, the City of Cape Town, the City of Ekurhuleni, and the City of Johannesburg — finance the upgrading of informal settlements. The authors use draft budgets and other supporting documents to specifically identify allocations to in-situ upgrade projects or programs. This approach was taken in order to exclude spending on other kinds of improvements or services to informal settlements.